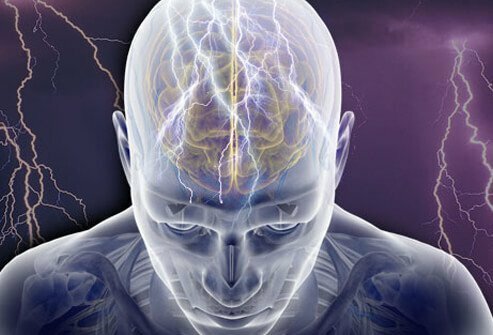 A seizure is abnormal and uncontrolled electrical activity in the brain, that may result in a physical convulsion, minor physical signs, thought disturbances, or a combination of symptoms. There are different types of seizures, depending primarily on what part of the brain is involved. Symptoms of seizures may range from jerking movements in a single extremity to abnormal movements throughout the entire body. Symptoms depend on which area of the brain the seizure originates. Some seizures may cause strange sensations, small repetitive movements such as picking at clothes or lip smacking, blank staring, crying out or making some sound, stiffening for a few seconds, the appearance of not breathing, a dazed or confused appearance, impaired consciousness, or repetitive blinking or other small movements, loss of bladder or bowel control, biting one’s own tongue, and a gradual return to consciousness, and confusion following the seizure. Signs and symptoms of seizures range from jerking movements in a single extremity to abnormal movements throughout the entire body. Some seizures may cause lip smacking, behaviorisms, staring spells, or other symptoms depending on in which area of the brain the seizure cause originates.Seizures may affect bladder and bowel control, and a person experiencing a seizure often bites his or her own tongue. Abnormal electrical activity in the brain triggers seizure activity. A person may have a seizure disorder (epilepsy) and require medications. Other factors such as hypoglycemia (low blood sugar), which is a diabetic reaction, may cause seizures. Meningitis or a head injury may also cause a seizure. Fainting can also cause a series of jerking movements as the person loses consciousness. These movements do not necessarily indicate a seizure.